Motion by Scott, seconded by Don, to approve the Treasurer’s Report. Motion carried, 3-0. • Township property. Lee will contact Beth Peterson, Southern St. Louis County Soil and Water District, to have her prepare a proposal and contract regarding her liaison with the county on necessary permits to access the property off Rossini and other coordination with the county as necessary, coordination of the work of Waste Wood Recyclers who will be clearing/logging the property, marking of the eastern boundaries of the township land, and a conservsation plan for future plantings. • Discussion of the contract with Waste Wood Recyclers. It was recommended that an end date be added to the contract to make sure the work is done. • Township Road. The county has required that work be done on West Branch Road to facilitate its plowing of the road. It has agreed to plow this year but said the work must be done by next winter. Scott will contact possible contractors to see if he can get a cost for the removal of various banks along certain parts of the road to prevent the plowed snow from falling back on the road and also to expand the turn around at the north end of West Branch Road. The cost is needed in time for the annual meeting in March and discussion of the annual levy. • Treasurer’s Position. Residents will be notified that the position of treasurer is open for the upcoming term through an email/mailed letter right after Jan. 1 A job description of the position will be attached. If there is not a qualified candidate, Option B will be voted on at the annual meeting which allows the township to appoint a treasurer. There is a treasurer in another township who has agreed to serve if no resident can. The job description is also posted on the township website. • Don agreed to be the Weed Inspector. The State has required that the township complete a weed control report and appoint a weed inspector regarding noxious or hazardous weeds. • Scott reported on his attendance at the annual Minnesota Township Association meeting on broadband internet on Nov. 18. • Scott read a letter to be sent to the St. Louis County Commissioners stating the township’s support of Normanna Township’s land use plan. Scott made a motion to approve the letter. Lee seconded. Motion passed. • January agenda – items for inclusion should be sent to Kim Hand in the absence of clerk Lita Wallace. Motion of Adjourn meeting by Scott, second by Don. Motion passed, 3-0. Meeting adjourned at 8:35. Minutes submitted by Judy Strom. Financing options for major road repair: Determine the cost of the work for each portion of the project. Possibly get a loan from the Credit Union and/or increase the levy request for next year. Solving the turnaround snowplow problem, as well as, not having enough room to push the snow. Possible ways to solve the problems: the embankment towards the lake can be filled in; and make the current turnaround area on a resident’s property bigger. Contingency Emergency Election and meeting location will be the Snowmobile Club building. Firewise Update: chipping is done and the total cost was $19,870 plus other expenses which is on-budget, below the $20,000 grant. Paperworks will be processed and submitted with checks paid and a report of the residents’ hours. Reimbursement is expected within a month. The Firewise committee was very impressed at the participation of the residents. Options for filling a vacant Treasurer position in 2017: (a) check with the community if they know someone who would be interested; (b) combine treasurer and clerk position, Option D, if clerk is interested (she is not); (c) if Kim decides to resign before the end of her term, appoint someone to replace her; (d) dissolve the township if we can’t find someone to fill the position which could happen when we are not able to fill-in the supervisor position, as well. If township is dissolved, whatever funds left will go to St. Louis County to be used towards the repair of West Branch Road. Received: St. Louis County Association of Townships meeting minutes for April 27, 2016 (approved) and May 25, 2016 (unapproved). Notice of General Election for posting from St. Louis County Election Department. Claims and Payroll – Check numbers 1088-1093 in the amount of $20,634.02. Next Meeting: November 1, 2016, 7:30 p.m., Pequaywan Fire Department, 8764 Pequaywan Lake Road Duluth. West Branch Road easement and ongoing effort to repair it in preparation for the work the county will be doing in the next year or so – The potential buyer in the turnaround area as discussed in last month’s meeting was not happy with the second option to cut down trees. Continue working with St. Louis County for the work to be done in this road. Most likely, due to cost, class V materials will be used. Firewise Program Update – The last run of the chipper is September 19 and plan to be finished 1st week in October. Fire signs have been distributed to residents. Directory will be worked on and finish in the fall. Logging on the township property – contract expired mid-July. Scott made a phone call to them and sent a letter but the logging company did not respond. Scott inspected the area and reported that there are not a lot of salvageable timber in the land. A resident mentioned that the company was logging close to the area. Scott, Lee and Don went over to discuss what their plans are on logging on the township property. It was proposed to offer them the timber for free if they do a good job of cleaning and $6300 if not, which was the original contract. Highway 44 Work Update – 8/10 of a mile will be worked on this month in part of Highway 44 north of the Fire Department where yellow sticks have been placed in the location. Election Emergency Plan – If an emergency makes a polling place inoperable prior to election day, the governing official must identify an alternative polling location as near to the designated polling location as possible. A suggestion was made that the Snowmobile Club building would be a good substitute. November Town Meeting – Due to the Tuesday, November 8, General Election which will run from 7:00 a.m. to 8:00 p.m., the November Town Meeting will be moved to Tuesday, November 1, 7:30 p.m. 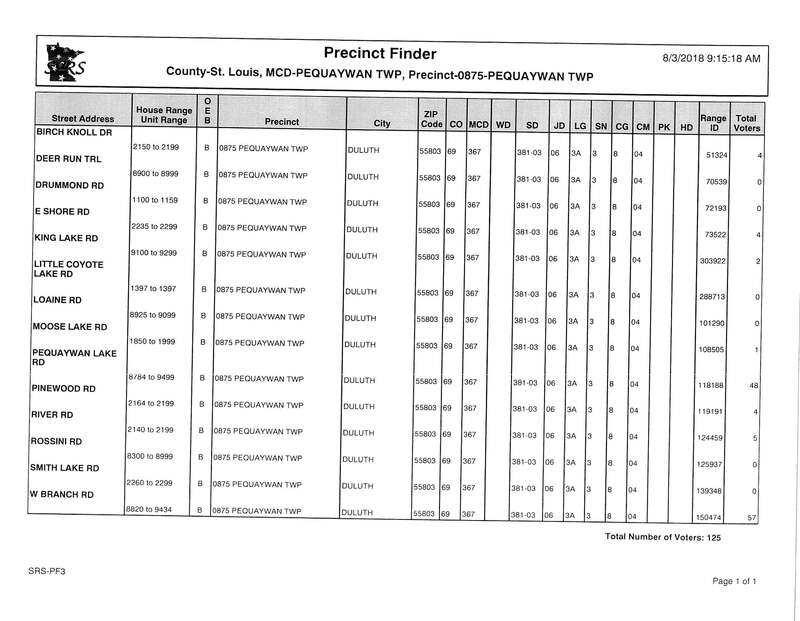 Received: Materials from St. Louis County Election Department re-Election Emergency Plan. Next Meeting: October 11, 2016, 7:30 p.m., Pequaywan Fire Department, 8764 Pequaywan Lake Road Duluth. The meeting was called to order by Chair Scott Mead at 8:30 p.m.
DNR Development Plans for an access to Pequaywan Lake – the 30-foot property next to Gordon Ramsey’s property should have been put up for sale but the Department of Fisheries said that it could not be sold as it will be used as a leverage for public access. West Branch Road Update – On July 20, Scott, Lee and Steve (of St. Louis County Public Works Department) looked at the area. The turnaround at the end of the road is not big enough for their equipment. The following are options: (1) Cut trees in the current turnaround property owned by Jim Stewart and will need his permission to do so; (2) Cut 15-foot wide x 50-foot long area of trees on the west side of the parcel to have plenty of room to push snow. St. Louis County will not be working on Highway 44 of the township area until 2018 and work on West Branch Road will not be started until 2018 after Highway 44 is completed. At that time, we will piggy back on the project. Logging on the township property – Contract expired mid-July. Scott called the logger on July 28 and again on August 5 but no return call. Lee suggested to send the logger an official letter of the contract expiration. Scott contacted DNR and he was given names to call to determine the value of the lumber. FireWise – 192 property owners received their new reflective signs. The chipper finished West Branch Road, East Shore and came down Pine Road. The chipper broke down as a crowbar was left on the tree and damaged it which is now non-fixable. Enough volunteer hours to cover the $20,000 requirement have been met. Review of the Northern Life Ranch Proposal – Per Tom Rukavina, Jon Trexel gave a presentation to the County Board. Any comments or complaints should be made in writing if the proposal is made before the planning commission. At the present time, it is not on the agenda for the planning commission. Received: $350 Dividend check under Workers’ Compensation Program from Minnesota Association of Townships Insurance Trust; Invitation from Minnesota Association of Townships to its District 10 Meeting in Twig on August 20; Letter from St. Louis County Auditor’s Office with copy of blank Township Final Levy Certification form for taxes payable in 2017. Public Comment – Pequaywan Association meeting is Saturday, August 13, at 10:00 a.m. at the Firehall. Picnic is also August 13 from 5:00 to 7:00 p.m. at Pequaywan Inn. • Scott reported that logging had not started yet on the township land. The contract to do so expires this summer. • Jonathan Trexel had not filed an application for a conditional use permit for his Northern Life Ranch as of June 3. • Discussion on obtaining material for signs to inform residents of township meetings, voting times, etc. The new Fire Department sign has a “holder” to the road side on which such signs could be attached. • Discussion was held on a request from a resident for a resolution opposing Minnesota House Bill HF 2415 on various gun control measures. Since the bill was not heard in any committee before the legislative session ended and so is considered “dead,” there was no need for any action on a resolution. Much of the discussion was about how information had not been passed along from the St. Louis County Association of Townships regarding the bill. Lee noted that the discussion at the SLCAT took place because someone from Colvin Township wanted to use the meeting to rally support for a resolution on the part of townships. It was not part of any legislative action on the part of townships or the SLCAT itself. Short of attending all meetings of the SLCAT, we have no way of monitoring what takes place there on a regular basis. • Discussion on a group called Positive Energy Outdoors. Don Swanstrom had received a call from a township supervisor from Normanna expressing concern about this organization and its use of trails in the area. • Discussion from a resident on whether the Fire Department could post No Burning or Burning Bans to alert property owners that no outdoor burning was allowed. There was no correspondence to report since the Clerk was not present. Motion to Adjourn, made by Scott, seconded by Don; (Scott yay, Lee yay, Don yay). The minutes from April meeting was approved with corrections. Motioned by Scott, seconded by Don (Scott yay, Lee yay, Don yay), motion carried. Motioned by Don, seconded by Scott (Scott yay, Lee yay, Don yay), motion carried. Dr. Jonathan Trexel answered questions and concerns of residents about his proposal to develop Northern Life Ranch on parcels of land he plans to purchase from John Wilson on the east side of Pequaywan Lake Road. Logging contract in the township owned land in Rossini expires in 2016. Scott reported that he contacted the logger and they promised to log this summer. The area has become a fire hazard. It has an area of 34 acres. Any income from the logging will be used to buy plants to transplant. Brimson Market requested to post market days in the posting board at West Branch Road which was approved but only for the July to September market days and not for the month of May. Scott will respond to the letter from St. Louis County regarding Snow Plowing Agreement. SENT: Emailed two completed forms to Arrowhead Abstract & Title Co.
Public Comment – First Pequaywan Association meeting is scheduled on May 21 at 10:00 am. Brush Day is June 11 from 9:00 am to 1:00 pm. Information on Firewise has been mailed to residents. Motioned to Adjourn at 9:00 p.m. by Scott, second by Lee (Scott yay, Lee yay, Don yay), motion carried. No changes. Motion by Lee, second by Scott (Scott yay, Lee, yay Don yay), motion carried. Motion by Lee, second by Scott (Scott yay, Lee, yay Don yay), motion carried. Clarification of the town clerk’s appointment term – clerk will serve for a term of two years from March 2016 to February 2018. Motion by Scott, second by Don (Scott yay, Lee yay, Don yay), motion carried. Road report update – Scott reported that he met with Steve of St Louis County Public Works at West Branch Road and confirmed that the county will be working on West Branch Road this summer. In addition, they can also work on the area owned by the township. They will furthermore discuss what the cost and payment schedule would be. The township will purchase the gravel and the county will do the work. Bad spots in Highway 44 will be patched next year. Local Board of Appeal & Equalization (LBAE) 2016 Assessment for Taxes Payable 2017 is scheduled on May 5, 2016 at 5:00-6:00 p.m. at Pequaywan Fire Department. Lita reported that LBAE Public Notice was posted in posting places on April 5. Levy request submittal – submit the form close to the deadline date. Information sharing on a proposed sale of land owned by John Wilson on Pequaywan Lake Road, south of the Township-owned land – residents voiced concern about the impact of double population in the area, delivery trucks coming and going, public access, peace and quiet. . For information on how residents can register their opinion, see Northern Life Ranch. Delivery of Automark for maintenance is either May 11 or May 12 at St. Louis County/Chris Jensen, 2501 Rice Lake Road Duluth, Laundry Facility. A resident interested in being an election judge and willing to attend the July 19 training – supervisors approved to have an alternate election judge. Lita will conduct training. Another resident present at the training expressed interest in being an election judge. She will be an alternate judge and Lita will also conduct training. Direct deposit of county checks – Kim suggested to have state and county checks be paid via direct deposit instead of checks and depositing to the credit union. Motion by Scott, second by Lee (Scott yay, Lee, yay Don yay), motion carried. Procedure when a check signatory board member is out-of-town during a meeting; and if clerk or treasurer is out-of-town, how would we handle correspondence received – The board member who expects to be absent can sign a blank check since no one can cash it unless signed by two other board members. As for correspondences, it will be advisable if someone can pick up their mail and be able to call one of the board members if there is any township incoming mail. (2) Workers’ Compensation Coverage update – Minnesota Association of Townships has surplus this year so they are mailing dividends to townships that have Worker’s Comp through them. Lita verified that Pequaywan Township will receive $350 in the mail in July. (4) Reorganizational meeting – elect Chair and Vice-Chair – During March, Scott Mead was elected as Chair but Vice-Chair was not voted upon. Scott motion Lee to be Vice-Chair, Don seconded ((Scott yay, Lee nay, Don yay), motion carried. (5) create a Written Policy for compliance with Data Practice Act requests, if none available – Lita will check the files if there was one created in the past. If none, she will put one together. (6) clerk is required to keep a copy of correspondence/s presented to the supervisors during the meeting with Meeting Minutes – Lita had been doing this since she started and will continue to do so. SENT: New town officers list sent to Minnesota Association of Townships and St. Louis County Election Department; State of Minnesota questionnaire on federal expenditures. Claims – Check numbers 1047 to 1050 were issued in the total amount of $1,782.98. Motion by Scott, second by Lee, motion carried (Scott yay, Lee yay, Don yay). Motion to adjourn at 8:35 p.m. by Scott, second by Lee (Scott yay, Lee yay, Don yay), motion carried.